For everybody who thought they’d never see another novel like The Lovely Bones, a neurologist in Provence struggles to get a comatose nine-year-old to tell what put him into a persistent vegetative state. Precociously acerbic Louis Drax has always been accident-prone. The Caesarian section that gave him birth nearly killed his mother. He’s survived food poisoning, salmonella, tetanus, botulism, and meningitis. Louis’s luck seems to run out on the day his estranged parents reunite long enough to take him to the Auvergne to celebrate his ninth birthday. Their picnic ends when Louis tumbles over a cliff and drowns in the river below while Pierre Drax runs away. But Louis hasn’t really drowned, as an alert morgue attendant notices that night. For months after his return from the dead, Louis improves until a seizure sends him to the care of Dr. Pascal Dannachot, of the Clinique de l’Horizon, formerly l’Hôpital des Incurables, and it’s here that British novelist Jensen (Ark Baby, 1998, etc. ), letting Louis and Dannachot take turns telling the story, heats things up. Dannachot’s unorthodox therapies don’t succeed in enticing Louis out of his coma, but his probe of Louis’s last day releases a torrent of dark secrets about Pierre and Natalie Drax. 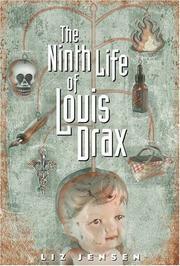 And as Louis, who has no intention of returning to a world of bickering parents and mocking schoolmates, enjoys the balm of new friendship with Gustave, the spectral figure who welcomes him to his ninth life, the intimacy the unsuspecting doctor seeks with both his young patient and the boy’s inconsolable mother turns toxic. A series of letters ostensibly written by the comatose boy accuses Dannachot of designs on Natalie Drax and warns of dire developments—though few readers will imagine the calamities still to come. By turns disarmingly comical, absorbingly suspenseful, and finally shattering.